"My dog bit someone!" No owner ever wants to utter these words, but what do you do when the unthinkable happens? Help, My Dog Bit Someone! I am seeking your advice on an incident that occurred with my dog. Sheila is a two-year old Shar Pei mix. I think she might be mixed with Pitbull, but I'm not sure. Anyway, she is a loving dog, and she likes to play, chew bones and do all the things dogs usually like to do. Today, one of my co-workers needed to stop by and pick something up from my condo. I walked in first, and a few seconds later my co-worker walked in the door alone. 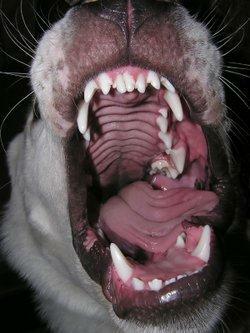 Sheila began to growl and bark, and the next thing I knew she lunged at my co-worker and bit her! I don't think it is ever really okay for a dog to bite someone, but could this have been normal protective behavior? Do I need to put her down? Please let me know. I'm sorry to hear about the position you are in. I hope your co-worker wasn't seriously hurt. Although Sheila's reaction was at first natural, most dogs would have stuck with barking and growling to defend the territory against a stranger. There should have been no reason for her to move into a full attack given the circumstances you've provided. I do not know what the laws are in your municipality regarding dog bites. Some authorities require you to report them, others do not. I think for the safety of all concerned, you need to discuss the event with your vet and get a professional opinion about your dog's temperament, which at this point is in question. You should also consult a lawyer about what happened, because your co-worker may choose to report the attack to the authorities. It's better to understand your rights as well as your options. Thank you for your question, and I hope you are able to resolve the situation without having to put your dog down.